and it’s really going to shove a tiny monkey wrench in my knitting time. I love to bake, I especially love it when it turns out delicious. Everyone’s happy when I bake (usually). Today was a perfect day…it was sunny, and bit warm and chilly and the wind was blowing pretty steady all day. Perfect day to stay inside and do what I love best. Reading, Knitting, Baking and just hanging out and relaxing with the BF. No plans. No places to be. No mini road trips. Nothing but a few chores and that’s it. A load or two of laundry was done, the grass was mowed for the last time this year (fingers crossed), a trip to the grocery store was made (by the BF, not me). The trip to the grocery store provided a small list of items that I had recently written up of needed materials for my breadmaker this holiday season. Included on this list was of course…canned pumpkin and dried cranberries. While the amout of those supplies was small (one of each), it was just mightly enough to spark my desire to make something with both. And something delicious. After putting most all of the groceries away, I gazed at the bag of dried cranberries sitting so nicely next to the solo can of pumpkin while sipping my coffee that I was happily drinking in the mid-afternoon, it is was a glorious Saturday after all. By a wonderful happenstance, I had also tackled the quick duty of pulling out a few recipe books — specifially one drew my eye: Fall Baking. I decided to flip thru the book to see if anything caught my fancy, and used both of the wondeful goodies that had arrived in my kitchen that afternoon. With only three pages left, I was starting to feel that moment of disappoinment that I wasn’t going to find anything and I would have to turn to my trusty iTouch to look up a recipe. Side Note: I had Tori Amos playing in my ears while I was emptying the dishwasher AND organizing my recipes. I turned the second to last page in the book, still holding on to a small glimpse of hope and that hope paid off. Jackpot. 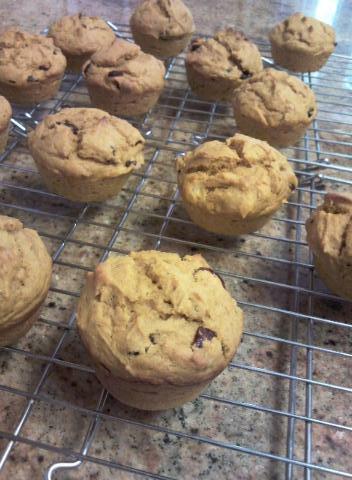 Cranberry Pumpkin Muffins (pecans optional — and not used because putting nuts into baked goods is against my religion). After a quick and brief victory dance, I set out to pull the needed ingredients and to get my mixing and my baking tools in order. 45 minutes later — these were magically and deliciously cooling. Round one was great — Round two will be even better.